Rina, the founder of Elev8Hope located near Stuart, FL, contacted us a few weeks back in regards to needing help with her website. She had another company make a website for her non-profit organization a while ago – but the ongoing cost was getting to be too much. 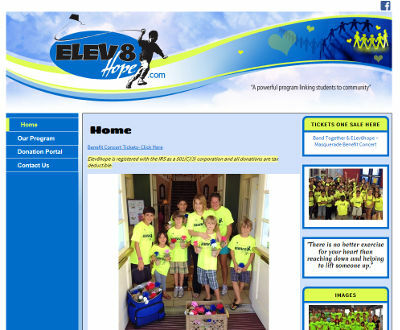 Elev8Hope was being charged $50 a month for an e-mail address and website hosting services. We cut that down by 80% when she changed over to us for e-mail and web hosting services – at only $10 per month. We worked with Rina to understand what three main pages she wanted to have transferred over to us to stay within our basic web design package. We then worked to conver those pages into a Content Management System (CMS) so that she could go in and update the pages as needed. After we were done, she was very happy with how quickly the process was completed (within about five hours of her order). She then requested that we setup an eCommerce ‘donation portal’ on the website so they could help to raise funds. She said that with the other provider, they would have charged $1,000+ for this kind of integration. We appreciate the business from Rina and hope to continue a strong relationship with her! The Elev8Hope website is at elev8hope.com.